Regular wrote: That Daft Punk robot was really pathetic. Compare it to Boston Dynamics works. I should be worked on before actually showing it. Net analogov vmire. Ffs. Hope they are not running on air and have proper financing. The point is that it's an avatar. It mimics the movements of its controller. Thus its infinitately flexible and you can use it to do anything - fire a machine-gun, drag a wounded man out of no-man's land, get into a vehicle and drive-off, etc... whatever you need it to do - it will do. I'm thinking that for starters, it would be great to have it drive around a medevac vehicle and evacuate wounded from the front-line, getting itself into the line of fire if needed. I don't think anyone else has done an avatar-robot yet for military-use, although I may be wrong. I'm possitive about those unmmaned fighting vehicles. They would be perfect for VDV. You can fit two of them instead of 1 BMD if there is a need to have more firepower. This vehicle could serve as a platform for SHORAD as in today it's very automatized. 1 operator would be enough. It could be semi autonomous with operator only needed to clarify and engage the targets. Teletanks basically - in WW2 it was shown that actual crew members are more reliable and cheaper. But of course that was in WW2. Nowadays having no crew is cheaper than having an actual crew inside that can be killed in combat, and the technology is more reliable and controllable - than the very complex system of electromagnetic relays used to drive and crudely aim teletanks remotely 75 years ago. The thing is though is that for every such teletank, you need a remote operator, perhaps 2. They will have to sit in their own, seperate vehicle - so really; you're not going to be saving any space if you plan to use something like this for the VDV. Any Avatar or remotely-controlled system is always vulnerable to jamming, disabling by localised area-effect EMP weapons, or even hacking attacks to take over the vehicle . Autonomous systems clearly do not share this vulnerability, but can AI systems be developed that allow machines to operate independently and reliably? Can they navigate a battlefield and perform correct target designation? Would we ever trust a collection of code and sensor inputs to control lethal weaponry? Big_Gazza wrote: Any Avatar or remotely-controlled system is always vulnerable to jamming, disabling by localised area-effect EMP weapons, or even hacking attacks to take over the vehicle . Autonomous systems clearly do not share this vulnerability, but can AI systems be developed that allow machines to operate independently and reliably? Can they navigate a battlefield and perform correct target designation? Would we ever trust a collection of code and sensor inputs to control lethal weaponry? Yes they are vulnerable to jamming of their cameras/sensors and control systems, their cameras getting damaged or destroyed through blasts and fragmentation, their command vehicles getting flanked and taken out and perhaps even of getting taken over by the enemy remotely, or disabled & captured physically along with all their sensitive equipment and encryption algorithms. There are many dangers here that do not exist or aren't so significant when you have a physical crew present in the vheicle. For sure remote-controlled vehicles such as avatars, teletanks and UAVs are not suitable for every use. They should be deployed only in an appropriate scenario/environment and used carefully. Regular wrote: That Daft Punk robot was really pathetic. as a murderbot its pathetic in its current state, yes. but its not made to be a murderbot in the first place- more like avatar as f_p said. then again nothing stops it from being sniper's avatar for instance, and it will really do great in that role once the whole thing is allowed to mature. Regular wrote: Compare it to Boston Dynamics works. I should be worked on before actually showing it. Net analogov vmire. Ffs. Hope they are not running on air and have proper financing. i dont see how boston dynamics works are better in any substantial way to the daft punk robo. Nor do i, if anything the ones from BD seem kinda overkill. I don't think something has to look cool to be useful. Russian combat robots will be showcased for the first time at the upcoming international military-technical forum Army-2015. The Russian Defense Ministry will for the first time present its combat robots at the international military-technical forum "Army 2015", which will take place in June, Russian sources said. "The Russian Defense Ministry's main research and testing robotics center will for the first time present the results of their work in the field of robotics at the international exhibition area in the Moscow Region town of Kubinka," the ministry's press service said on Friday. 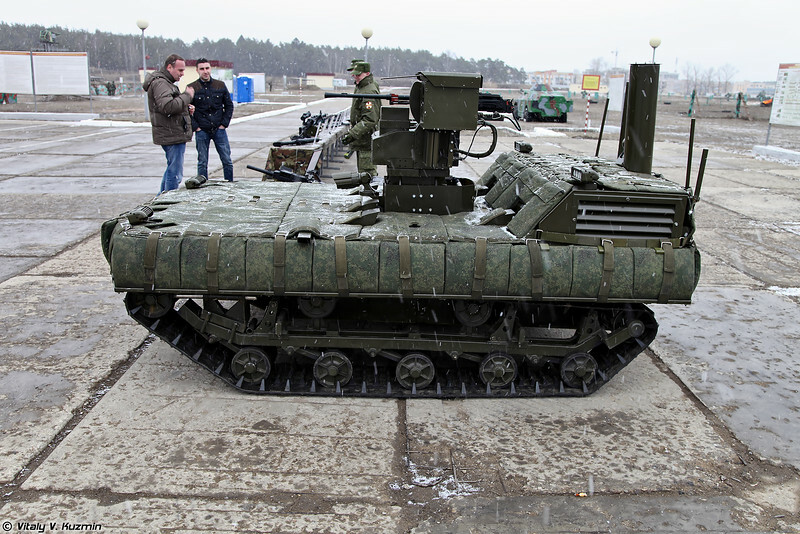 It added that the Army-2015 forum will see the presentation of characteristics of combat and double-purpose robots made in Russia and beyond. Additionally, visitors will see an archive of tests of ground, water and air robots. "The center's exhibition stand will also present several experimental models of robots for military purposes," the press service said. According to it, the first batch of robots has already been supplied to the engineering troops, navy, as well as reconnaissance units of land and airborne forcers. The center's robotics-related activity includes work on the creation of unmanned aerial vehicles, ground robots, underwater unmanned vehicles and unmanned motor boats. The international military-technical forum Army-2015 will be held in Patriot recreational park in Kubinka between June 16 and June 19. Russian Company KAMAZ will create artificial city as testing ground for unmanned vehicles. Russian Company KAMAZ is proposing to create an artificial city as a testing ground for unmanned vehicles. (...) In it, trucks without drivers will test out moving through traffic and navigating complex intersections and pedestrian crossings. Models of cars, motorcyclists, bicyclists, and pedestrians will be placed on the testing ground. (...) The automaker plans to develop about 20 prototypes of unmanned vehicles for different purposes by 2025. MOSCOW, May 12. /TASS/. The United Instrument-Making Corporation integrated into Russia’s state hi-tech firm Rostec is developing a universal tracked modular robotized platform for combat, fire-extinguishing operations and Arctic expeditions, a Russian defense official said on Tuesday. 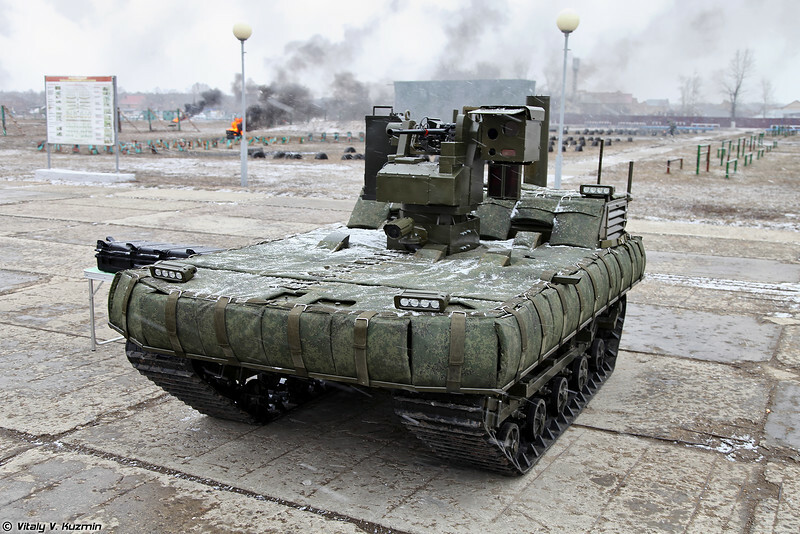 A subsidiary of the Russian state technologies corporation Rostec is developing a universal tracked robotic platform that could be used in both combat and rescue operations, the company's deputy CEO said Tuesday. "The URP-01G robotic platform is a universal armored vehicle designed to work in locations that represent a serious threat to people's lives. It can be used during military action, reconnaissance, emergency situations, rescue operations and demining," Sergey Skokov told reporters. According to Skokov, Rostec's subsidiary United Instrument Manufacturing Corporation (UIMC) is set to produce a range of systems based on the URP-01G platform. The deputy CEO listed various purposes to which the systems could be tailored, such as carrying out strikes, protecting and patrolling, mine clearing, radiation and chemical reconnaissance, as well as for police and Arctic expeditions. The creation of robotic systems is considered by a range of Western states to be one of the most promising directions for the development of their armed forces. Russia is also assigning special importance to the manufacture of such systems, something underscored by the decision to include them in the 2016-2025 State Armament Program. Great thread. I see perspective in near future. Most def. Army is getting some cool toys. At the end, it fires a missile. If you look closely at the two different launchers, you will see that the Uran has two larger ones on the right launcher, and three smaller ones on the left. I am going to assume that the ones on the right are most likely Metis, or Kornet(Hopefully Kornet-EM ) and the ones on the left are unguided, perhaps RPO-A or Byp. they have a huge range of rocket types that could be used... from the engineer rockets like RPO, LPO, and MRO families of rockets to the thermobaric engineer rockets for a range of targets. MOSCOW, May 18. /TASS/. The multi-functional combat robots of the Uran family have been armed with the remote-controlled weapon systems Ataka, a source in the defence-industrial complex has told TASS. According to earlier reports, the Uran robots underwent successful testing at a proving ground in Novorossiysk, including live gun and machine-gun firing tests and launches of guided anti-tank missiles. Defence Minister Sergey Shoigu watched the trials. Later, a source in the defence industry told TASS that future robots might be equipped with electric transmission. The Ataka system is meant for destroying tanks and other armour and small size targets, fortifications, manpower and air targets flying at low altitudes at a speed of up to 400 kilometers per hour. Also, Ataka can be used for small tonnage surface targets. The system is capable of operating in day and night-time conditions. Ataka is installed inside the turrets and combat compartments of various combat vehicles and also on naval ships. Good. Now they have to thought of a system how to operate there robots on bigger distances? UAV retransmission? SATCOMM? Flanky wrote: Good. Now they have to thought of a system how to operate there robots on bigger distances? UAV retransmission? SATCOMM? These are for urban situations, why would you need to operate them from long distances. I believe these can be operated from 5km away max, and can be operated from a command vehicle. Well because of recon missions on the ground? For front line fighting and urban areas its ok but you might want to have "boots" on the ground patrolling borders for example or front line.... as a complement to UAVs... or to have dedicated base protection hardware is not a bad thing as well... kind of mobile automated defense turrets.... I mean thats the current development trend.